It is axiomatic in life that out of great trauma can come great beauty. Some of the world’s best artists have had very difficult personal lives, and have turned the ashes of their lives into the beauty of creative work. That can be true in nature, as well. About 3,000 years ago Santorini faced one of the world’s greatest natural calamities. Out of that calamity came on of the world’s most beautiful natural formations, the Santorini caldera. Wikipedia says that the word “caldera” comes from the Spanish for cauldron or cooking pot. It further defines Caldera as “a cauldron-like volcanic feature usually formed by the collapse of land following a volcanic eruption”. You’ll never forget sailing into the Caldera of Santorini for the first time. The boat enters its waters by way of the 2 kilometer-wide opening between this comma-shaped island and its smaller companion, Thirasia, which helps complete what was once a circular land mass and is now a comma, an islet, a few other small islets, and, at its center, a sometimes still-smoking land mass of the volcano slowly rising from the sea. Its last eruption was in 1950. To complete the spectacular sight, the white of Cycladic houses and churches frost the top of the volcanic cliffs to the east, or left, like fresh snowfall or the white decorations on a chocolate-colored cake. At Athinios, the port, passengers and vehicles disembark and begin the winding, switch-backed 300-meter climb to the sheer summit of the crater and an open view of the entire Caldera, the volcano, the encircling islets, and the ships creating white wakes as they approach or leave the landing at Athinios. Once only donkeys, loaded with the travelers’ luggage, made this trip, but now a decent two-lane road has been carved into the upgrade. Donkeys are still available for those nostalgic for the past, and a third option is a one-way cable car to Fira. 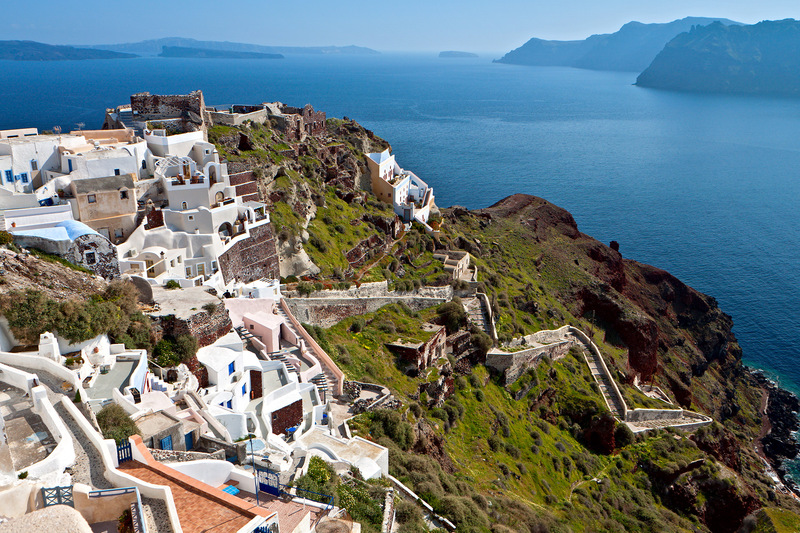 Because of its volcanic history, Santorini is easily the most spectacular of the Greek islands. It is one of the most popular, if indeed not the most popular, island destinations in the world. It offers dramatic views, ancient, volcano ash-buried cities, towns perched on the lip of sheer cliffs like white building blocks, lovely beaches, great food, locally distilled wine, and that active volcano that conveys a sense of natural beauty and apprehension, given its habit of erupting every so often. 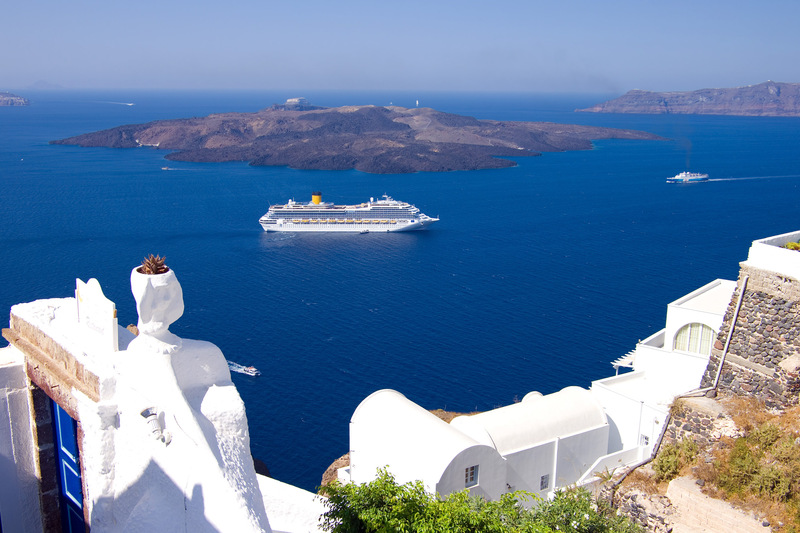 Santorini, without the Caldera, would be very average- even below average- as a Greek island. It wouldn’t have nearly as much to offer as other island destinations, and would not attract a tenth of its enormous tourist trade. So Santorini is all about the Caldera, and rightly so. Some people say that as many people visit Santorini as visit Greece, which is remarkable, because you have to pass through Athens to get there, and Athens, of course, has the Acropolis. The island was first called Kalliste, a superlative of best, like saying “the most best.” During that period of antiquity the Phoenicians had settled on the island, and they stayed there until Thiras showed up. Another ancient name for Santorini is Strogili, which means “rounded.” This refers to its former circular shape before the island blew sky-high over 3,500 years ago, and its still-approximately round shape if you include the smaller islets in its orbit around the Caldera. In the Argonautica, the 3rd century, BC story of Jason and the Golden Fleece, Triton, messenger of the sea and son of Poseidon, gives a very strange origin myth of Thira to the Argonaut Euphemus, who himself was a son of Poseidon and given the gift of being able to walk on water. The story of Jason dates to at least 2,000 BC, but the Argonautica is the best written version we have. Triton gives Euphemus a clump of dirt which Euphemus then carries next to his heart for several days. One night Euphemus dreams that he began to nurse the dirt, which then turned into a woman with whom he had sexual relations. The woman tells Euphemus that she is a daughter of Triton named Kalliste. If Euphemus would throw the dirt into the sea, it would grow into an island where the descendants of Euphemus could then live. The story goes that Thiras, original colonist of the island, was a descendant of Euphemus. 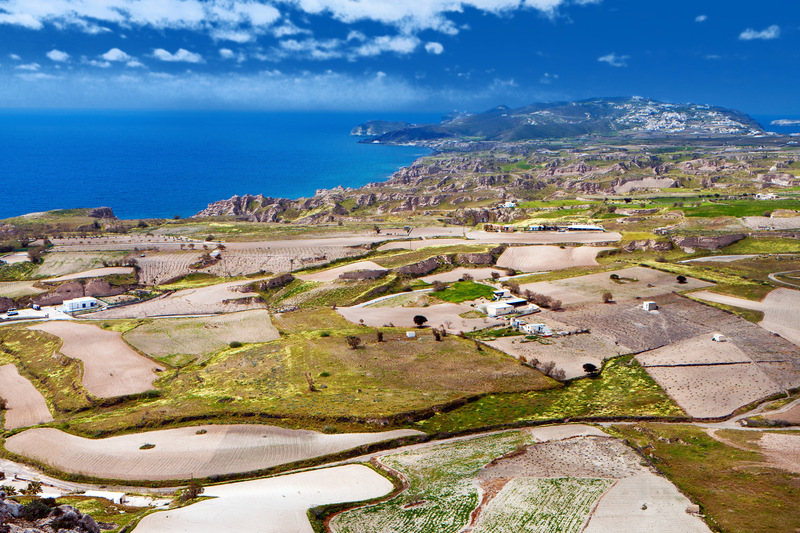 Between 3000-1600 BC a large, lively Bronze Age city named Akrotiri thrived on the south coast of this now comma-shaped island about 10 km south of the contemporary capital city of Thira. Back then, Thira was “strogili,” in its fully rounded original shape, with, presumably, and ever-rising volcanic cone in the middle of its land mass. The volcano around 1625 BC in an event known as The Minoan Eruption. The advanced infrastructural features of Akrotiri (including indoor plumbing with hot and cold water), and the city’s general layout resemble the description of the lost city of Atlantis given by Plato. The Dorians came next, and around 900 BC founded the Greek city of Mesa Vouno on what is by far the highest mountain top on Thira, in the southeast part of the island, 400 meters above a plain which overlooks the sea. The settlement was safe from attack, and its farmers had to descend a steep track daily to work the fields in the plains below. The Dorians named the settlement, and the island, “Thira,” after their leader. Now the city is called Ancient Thira. In the 5th century, BC the Dorians on Thira opted out of membership in the Delian League, the large group of city-states allied against Persia, and in the subsequent Peloponnesian War at the close of the century, Thira aligned herself with Sparta against Athens. Athens then conquered Thira, but later it became a base for the rulers of Egypt at the time, the Ptolmeys, heirs of Alexander. After that it was the Romans, and then the Byzantines. The volcano experienced a major eruption in 727 AD, burning the island with its fall of hot ashes, and the air becoming superheated. After the year 1000, during the era of the Crusades, the Franks attached Thira to the Duchy of Naxos and named it Santorini- St. Irene. The Ottomans took over in 1579. 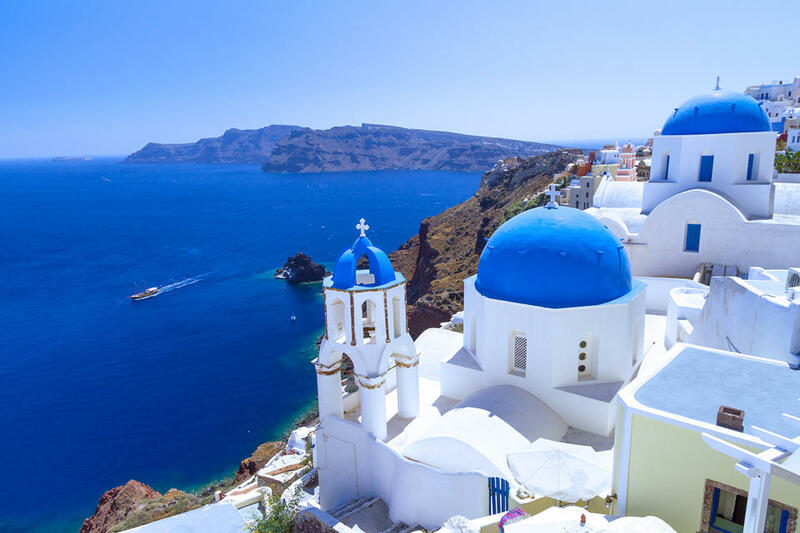 Santorini was finally reunited with the modern Greek state in 1912, some of the last territory to be added after Greece gained her independence from Turkey following the war of 1821.. The most significant event in modern history was an earthquake in 1956 which followed a minor 1950 volcano eruption. The earthquake did a lot of damage to the island’s infrastructure. As Santorini rebuilt, it focused more and more on the growing tourist trade, until tourism now dwarfs any other source of income on the island. There are four villages sited on the lip of the Santorini’s caldera and offering unforgettable views. 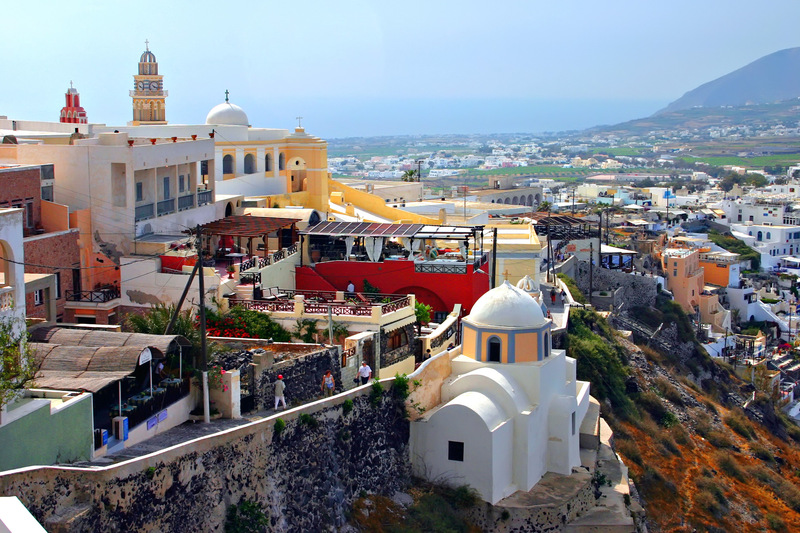 They are, from south to north, Fira, Firastefano, Imerovigli, and Oia. But before going into details about those, let’s explore the focal point of the island, the volcano. It last erupted in the 1950’s and has been mostly quiet since then. In 2012, however, geologists report that its underground magma chamber was expanding quickly. Then it slowed down, and the volcano has been relatively quiescent since then. So the volcano sleeps for now, and rather uneasily at that. The island of Nea (New)Kamini emerged from the depths of the caldera in 1707, right next door to the older island of Palia (Old)Kamini, where one can indulge in hot mud baths. There are a number of excursion boats that go to the volcano, about a 10-minute trip from the old port of Fira. After that you get a little more than an hour to tour the active craters by way of a path that leads to the summit of Nea Kamini. Accompanying the end-of-the-world vision of smoking craters is the strong smell of sulfur. You can then move on to Palia Kamini, visiting the mud baths and hot springs. At the little inlet of Agios Nikolaos the temperature of the sea is bathwater-warm year-round. On the opposite side of the waters of the caldera is the smaller island of Thirasia, which is also the rim of the volcano and helps complete its circular configuration. The view from Manola, the chief village, perched on the lip of the volcano, is every bit as dramatic as the villages across the way on Santorini. It also has a nice black sand beach. Thirasia is both cheaper and quieter than Santorini, and a way to enjoy the beauties of the caldera at a discount.